Central to the upgraded multirole capability of the Dash 5 is the RDY radar developed by Thomson-CSF/Detexis. Development of the RDY radar began in 1984 and the programme proceeded smoothly. In July 1987 the first of nine prototypes took to the air in a Falcon 20, and seven years later in December 1994, Thomson-CSF were able to deliver the first production standard set. RDY is the result of Thomson-CSF´s experience gained from producing four generations of fighter radar, in particular the RDI radar -the first Pulse Doppler radar developed by Thomson-CSF. The RDY can select one of three PRF (Pulse Repetition Frequency) modes, namely low, medium and high when operating in the air intercept mode (Auto Waveform Management). Low PRF is employed in the Look - Up mode. 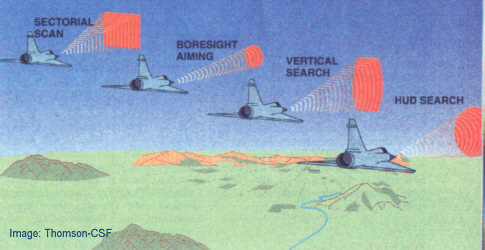 High PRF is best suited to long range Look - Down, while Medium PRF is used at all altitudes due to it´s reliable target detection properties. Thomson - CSF have developed algorythms that continually optimise the wave form to guarantee the highest target discrimination, even when the enemy is using advanced ECM. RDY has proved it´s ability to accurately measure target range even in heavy ground clutter and consistently demonstrates a “False Alarm Rate” of zero. When operating in the air-to-ground mode, the RDY employs Doppler Beam Sharpening, terrain mapping and air-to-ground ranging. RDY can simultaneously detect 24 airborne targets, irrespective of their altitude, track the eight most threatening and auto-prioritise four of them. Thomson-CSF/Detexis quote the look-up,look-down, shoot-up,shoot-down performance as being 70 km. In actual practice engagements conducted by the French AdlA, RDY has demonstrated it´s ability to detect, reliably, fighter size targets at 140 km. Great effort has been made reduce the effectiveness of any ECM that the enemy might choose to employ. Of significance is the advanced signal processing and the Monopulse receiver with it´s three independent channels.The RDY is however being developed further. The latest version, RDY-2 has a 15% greater air-to-air range, a SAR (Synthetic Aperture Radar) mode that allows ground mapping with a resolution of less than one metre and refined moving ground target tracking.